Mud flaps custom made, drill-less mudflaps are made from the finest quality materials available and designed not to tear, peel, fade, rust or break. Our no drill custom mud flaps are made from a 3/8" polyethylene/rubber blend; with anti-sail and anti-spray capabilities. The anti-sail design prevents wind from pushing the mudflaps up, giving your truck increased protection from rock chips. Our exclusive "Rain Grooves" direct rain, snow & road debris down and away from the vehicle. Available with or without our 304 Mirror Finished Stainless Steel polished weights, both with the same high-quality materials and protection. Select from our custom designs or create your own custom masterpiece. Stainless steel weights have a framed finished look. Full size mud flaps providing more protection than splash guards. Standard sizes and shapes also available for modified or import trucks. Chevy, GMC, Ford, Dodge & Hummer mud flaps all make great gifts for that special someone. 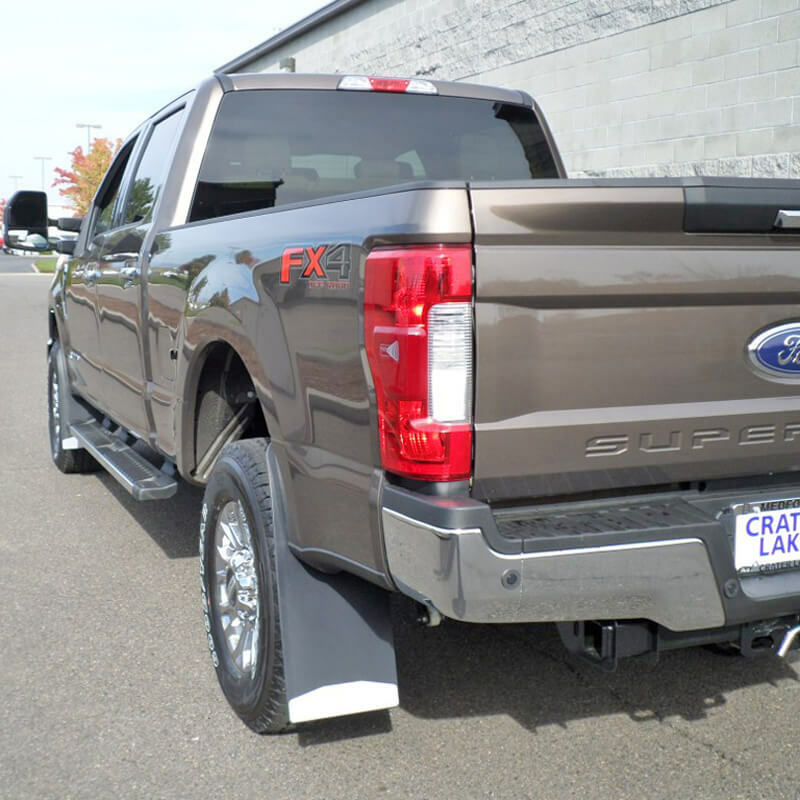 Lifted Trucks - Don't forget to check out our Lifted Truck sections for a variety of options. [Click Here]. DuraFlap RV splash guards have a 14 gauge Galvanized Backing plate with a reinforcement bend to give extra strength and protection against road hazards, and for use as a drag lip while going up steep inclines. We utilize thick double nylon reinforced belting for longevity. See our RV page for rock guards, RV Mud Flaps and more details [Click Here].